Bill S. Preston, Esquire, and Ted “Theodore” Logan. The Great Ones, as some call them, are quite possibly the best duo in history. But who is the greatest Great One? Years ago I saw a tongue-in-cheek list of the best and worst things to come out of the 1980s. On the “Best” list it had Ted while on the “Worst” list it had Bill. But is that a fair judgment? It might seem crazy to try to separate the two and compare them since they work so flawlessly in conjunction with each other. But that’s just what I’m going to do because I want to get to the bottom of who is actually the best. I definitely wouldn’t consider either Bill or Ted one of the worst things to come out of the ‘80s. Romance – Who’s the more romantic of the two with the ladies? Zingers – Who is the funniest and most quotable? Dads – Who has a more interesting family life? Physicality – Who is stronger and more physically capable? Wisdom – Who is wiser? I’ll explore all of the evidence in each section and then make a final verdict for each one. Whoever wins more categories will be declared the winner. Join me on this most triumphant adventure as we compare Bill vs. Ted! Romance doesn’t seem like it should be the highest priority for Bill and Ted at the outset of their adventure. But Ted tells himself to keep an eye out for a couple of princesses, so he has love in the back of his mind. Ted is the ladies’ man. He devises a way to sneak into the castle to meet the princesses in Medieval England. Ted comes up with a poem on the spot to ask the princesses to Prom. Bill and Ted write their own proposals to the princesses. Bill enthusiastically compliments his girlfriend for standing up to the evil robot of himself, even though she doesn’t know that’s what he is. Bill seems to enjoy having his girlfriend walk through his ghostly body more than Ted enjoys his own girlfriend doing the same thing to him. Bill and Ted get right to work starting their families in the midst of their intense 16-month training. They even spend their honeymoon in Medieval England, which is a particularly nice touch. They really care about their wives’ feelings of homesickness. Verdict: I’ve got to give this one to Ted. Even though Bill does an excellent job of treating his girlfriend like… well, a princess, if it weren’t for Ted’s romantic instinct, they never would have met in the first place. Bill and Ted have quite a few quotable lines across their two films. I’ll leave out the ones that both of them say at the same time and only include the ones that are uniquely theirs. Sit back and enjoy their quirky dialogue. Teacher: Who was Joan of Arc? Ted: Noah’s wife? Bill: Hey, Missy… I mean Mom. Ted: It’s your mom, dude! Bill: Let’s reach out and touch someone. Bill: He’s famous, dude. Let’s bag him. Bill: Dude, you gotta have a poker face like me… Whoa, three aces! Ted: All we are is dust in the wind, dude. Ted: Those are historical babes. Ted: These things are heavy. Bill: Yeah… heavy metal. Ted: I’m Darth Ted. Bill: Well, I’m Luke Bill, and you’re not my father! Bill: You killed Ted, you medieval dickweed! Bill: How’s it going, royal ugly dudes? Bill: I am the Earl of Preston. Ted: And I am the Duke of Ted! Bill: Be excellent to each other. Ted: Party on, dudes! Bill: Girls mature faster than guys. Ted: They’re from Medieval England… Uh, Medieval England, Iowa. Ted: I can’t believe Missy divorced your dad… and married mine. Ted: Our girlfriends are most chaste. Bill: At least they’re not dating our dads. Bill: It worked in The Exorcist… 1 and 3. Bill: Dude, this is a totally deep hole. Bill: We got totally lied to by our album covers! Satan: Choose your eternity. Ted: Choose your own, you fag! Bill: Dinner’s over, worm dude. Verdict: This is a tough one. Ted starts out strong. He has a better comeback during history class than Bill. Bill just says that Napoleon is dead while Ted cleverly surmises that Joan of Arc was Noah’s wife. They’re pretty even from then on. Maybe it’s Alex Winter’s slightly better comedic timing, but Bill’s lines are usually funnier than Ted’s. Don’t get me wrong, Ted’s “Party on, dudes,” “I am the Duke of Ted,” and “Medieval England, Iowa” lines are all epic and extremely memorable. Bill just seems to be more talkative than Ted. On the other hand, if it weren’t for Keanu Reeve’s wonderful reactions, Bill’s “Shut up, Ted!” lines could have come across as mean-spirited. The fact that Ted doesn’t react bitterly and sometimes even smiles in response turns those moments into comedic gold while also perfectly demonstrating their affection for each other. It’s close, but Bill wins this one by a nose. Bill and Ted have interesting dads. Bill’s is extremely distant while Ted’s is extremely overbearing. 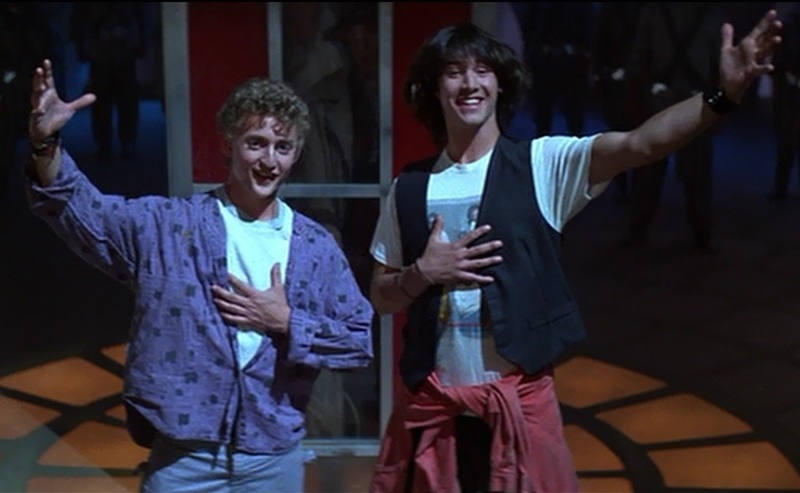 There are a few ways we could interpret Bill and Ted’s behavior based on their upbringing. We could say that Ted manages to be himself despite his dad’s efforts to turn him into a disciplined young man. We could also see this as Ted’s way of rejecting his dad’s rules and trying to go his own way. I don’t see Ted as the rebellious sort. He’s a good kid, and it’s not like he’s into drugs or anything harmful. He just knows what he loves, and he has a kindred spirit in his good friend Bill. He’s proud of his dad being a good cop, and he’s sorry to have to disobey him to do what he knows is right at home and at the police station. We see much less interaction between Bill and his dad. From what we see, it appears that Bill doesn’t have much fatherly guidance, so it makes sense for him to have forged his own path without his dad’s help. He’s definitely more of a leader and a take-charge kind of guy in his friendship with Ted. I think this comes from his loneliness as an only child and the void in his life left from his frigid relationship with his dad. He seems like an aimless drifter, but he actually has a great purpose to his life, and he acts boldly, like a man on a mission. Ted is willing to receive psychoanalysis by Sigmund Freud while Bill refuses in a good-natured kind of way. Ted learns about his dad’s own fears and how they’ve been transferred onto himself while Bill already understands his own personal problems. The deciding factor between Bill and Ted’s dads is the police station scene in Bill and Ted’s Bogus Journey. Ted’s ghost jumps into his dad’s ear in the middle of a police briefing, and the results are incredible. Ted’s dad takes on all of Ted’s mannerisms and speech patterns to the point that the audience completely buys that it’s Ted speaking directly through his dad. The moment when Ted’s possessed dad says, “I totally possessed my dad!” and then plays an old-fashioned air guitar produces one of the biggest laughs in the whole film. The sergeant who Bill possesses is dreadful by comparison. Verdict: Ted was born to win this one. Despite being in good shape and eventually being named “Sportsmen of the Decade” by Sports Illustrated (at the end of the second film), Bill and Ted aren’t terribly athletic or at least they don’t show off their strength very often. In their first action sequence, Bill admits to a bunch of Old West cowboys that they’re totally weak and can’t possibly fight them. Ted even tries to appease them with a nonsensical bribe, which doesn’t work. They’re pretty evenly matched when they face off against each other. When they start swordfighting in heavy suits of armor, Ted gets the drop on Bill at first, but Bill soon gains the upper hand and wins the fight by making Ted fall down a flight of stairs. Later, Bill even manages to hold his own as he spars with Joan of Arc. As Bill and Ted are dragged up a rocky formation to their deaths by their evil robot selves, Ted doesn’t even try to fight it while Bill at least kicks his robot double a couple of times. Ted has an easier time pulling himself to safety on top of Satan’s death machine. He even helps Bill after he almost falls down. 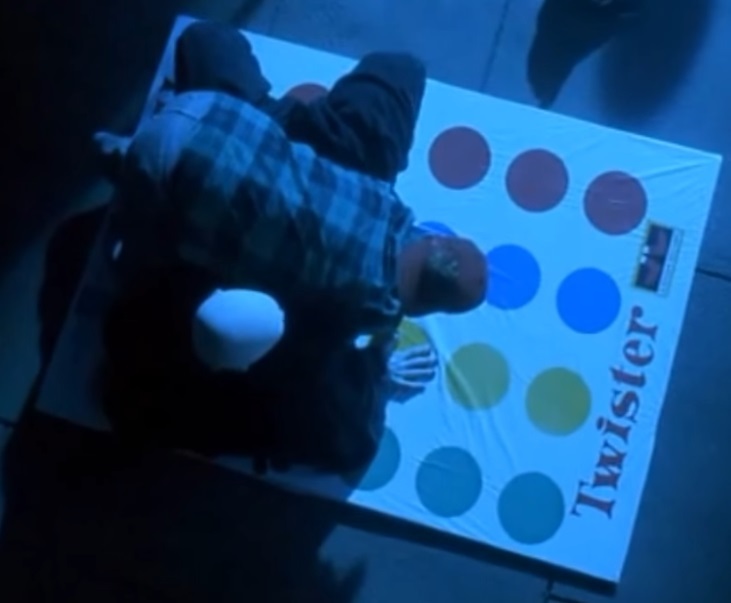 Not long after that, Bill demonstrates his strength and flexibility when he beats Death at Twister. This decisive victory is what finally convinces Death to admit defeat. Verdict: Bill barely edges out Ted. He’s shorter than Ted, but he’s feistier and he comes through in a pinch. We’re tied 2-2, so this will be the deciding factor. Who is the wiser of the two? Let’s find out! Ted has a bad memory when it comes to winding his watch. However, his memory gets better because he later remembers to set up a trash can to land on his dad in the prison cell. Bill comes up with the idea to bring historical figures to modern-day San Dimas. Bill’s quick thinking rescues Ted from being grounded by his dad. Ted doesn’t understand the power of the poker face. Bill does, but he, too, can’t help showing his hand prematurely. Ted, meanwhile, tries to offer free passes to Waterloo to avoid a fight with cowboys, but his attempt fails. Ted philosophizes with Socrates, but Bill helps Socrates understand what Ted was talking about. Bill breaks the antenna, but he also fixes it with a few cans and some chewing gum. So we’ll call it a wash.
Bill comes up with the time-travel scheme to get Ted’s dad’s missing keys. Bill thinks of the tape recorder idea, but then Ted comes up with the content on the tape. Ted interprets for Socrates. And the results are so great. Ted admits that he and Bill need to learn how to play guitar if they expect Wyld Stallyns to become a great band. Ted has good intuition. He has a bad feeling about the other Bill and Ted who show up at their apartment. If Bill had listened to him, they would have been spared a lot of pain. Bill comes up with the plan to possess Ted’s dad. In a quick game of 20 Questions, Bill needs just two questions to guess that Ted is thinking of a tank. Ted thinks outside the box and sinks Death’s battleship in a life-or-death game of Battleship. Ted comes up with a plan to build good robot versions of himself and Bill to counter the evil robots that killed them. Bill cooks up a plan to mug three enlightened people and steal their clothes in Heaven. Ted convinces St. Peter to let them into the presence of God. Bill quickly plans for a sandbag to disarm De Nomolos while Ted plans for a cage to lock him up. Verdict: When it comes right down to it, the wisdom of Bill and Ted is contained in their most famous lines, “Be excellent to each other” and “Party on, dudes!” Bill tries to offer words of wisdom for people of the future to follow in order to help them be happy. But Ted recognizes that they shouldn’t take themselves too seriously, and it’s okay to have a little fun. Bill is the more logical of the two while Ted goes with his heart. Bill usually defers to Ted when it comes to saying profound things. While Bill beat Death in a physical contest in the form of Twister, it was Ted who did the impossible first and beat Death in a game of wits called Battleship. But the thing that sets Ted apart the most is the fact that he recognizes his own shortcomings. As Bill noted once, “The only true wisdom consists in knowing that you know nothing.” Ted is the one who humbly admits that he and Bill need to be realistic and learn how to play the guitar. At a critical moment, he notes that the only one who can save them from hell is the Grim Reaper. And he points out that the evil robots are too powerful for them to take on by themselves without the help of good robots. Ted is the wisest. 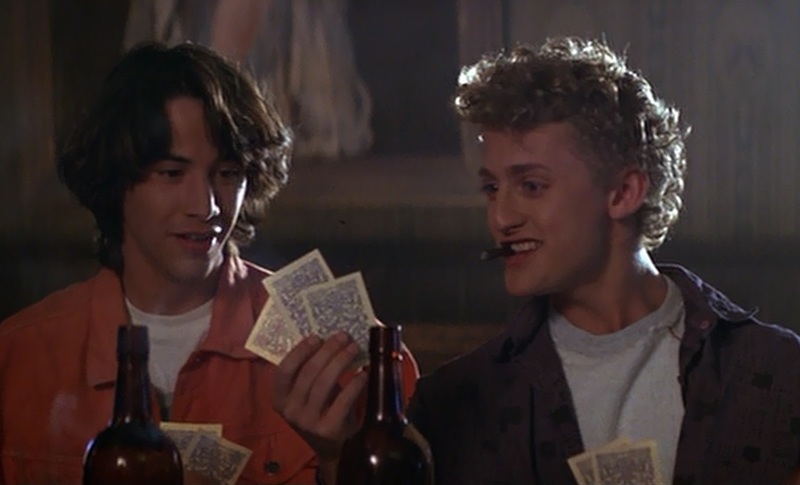 This entry was posted in Movie Matchups and tagged 1980s, bill and ted, bill and teds bogus journey, bill and teds excellent adventure, comedy, films, funny, humor, jokes, movie review, movies, romance, science fiction, sequels. Bookmark the permalink.